GIRL POWER: 2017 queen Dainalyn Swaby shares lens time with runners-up Ava-Gail Lindsay and Naresha Jackson. 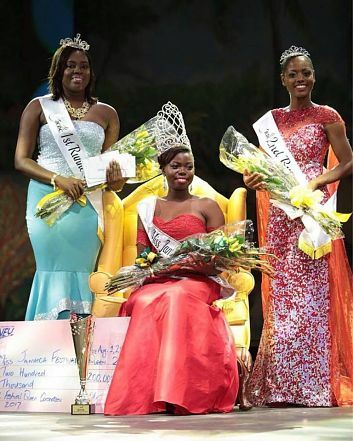 IT was a historic night inside the National Arena on Tuesday, as the bread basket parish, St. Elizabeth, got its first hold on the Miss Jamaica Festival Queen title, thanks to the impressive efforts of Dainalyn Swaby, a poised and passionate 24-year-old. The writing was on the wall from early in the night, but by the time the sectional prize winners were announced, Swaby was a shoo-in for the crown. The Hampton School graduate picked up awards for Most Culturally Aware and Most Poised. In addition to those awards and the championship trophy, she took home a $450,000 cash prize, a $200,000 grant to support her national project and an additional $180,000 to fund the project. St. Ann’s Naresha Jackson won second place (and the award for Most Active in the Community), while third place went to St. Mary’s Ava-Gail Lindsay. Westmoreland’s Daniela Woodbine and St. Catherine’s Josselle Fisher completed the top five. Ashley Anderson of Hanover was adjudged the Most Congenial contestant.